To create a clipping mask, you need at least two layers: one to create the shape of the mask, and the other to supply the content for the mask. You can use a type or an image layer to create the clipping mask shape, and when the shape is the way you want it, you can position the pointer between the two layers, then press [Alt] (Win) or [option] (Mac). The pointer changes to two circles with a left-pointing arrowhead. Simply click the line between the layers to create the clipping mask. You can tell if a clipping mask exists by looking at the Layers palette. A clipping mask is indicated when one or more layers are indented and appear with a down arrow icon, and the base layer is underlined. [Alt] (Win) or [option] (Mac), position the clipping mask pointer over the line separating the grouped layers on the Layers palette, then click the mouse. You can also select the base layer, click Layer on the menu bar, and then click Release Clipping Mask. 1. Click the Join in the fun layer on the Layers palette to make it the active layer. 2. Drag the active layer below the Nuts layer on the Layers palette. 4 ^ to the line between the Border Fruit and the Join in the fun layers. Compare your Layers palette to Figure 24. Verify that the clipping icon (a small downward pointing arrow) appears in the Join in the fun layer, then compare your Layers palette to Figure 25. Make sure the Join in the fun layer is active, click the Opacity list arrow on the Layers palette, drag the slider to 100%, then press [Enter] (Win) or [return] (Mac). 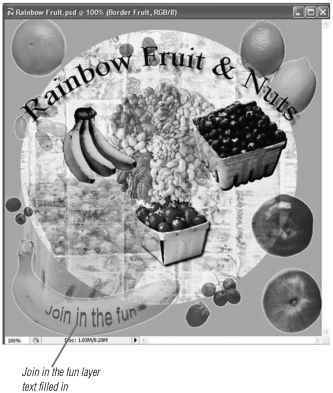 You created a clipping mask, using the Border Fruit layer as the base and the Join in the fun layer as a member of the clipping mask to make the banana peel appear as the fill of the Join in the fun layer, and then you adjusted the opacity of the Join in the fun layer. 1. 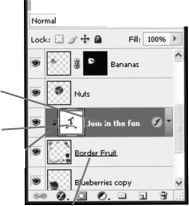 Click the Border Fruit layer on the Layers palette. 2. Hide the rulers and guides. 3. Click Layer on the menu bar, then click Release Clipping Mask. 4. Click Edit on the menu bar, then click Undo Release Clipping Mask. Compare your screen to Figure 26. 5. Click File on the menu bar, click Save As, then, using the name given, select the As a Copy check box. 6. Type copy after the original filename if it does not automatically appear in the File name text box, then click Save. 7. Click Layer on the menu bar, then click Flatten Image. 8. Save your work, then close the file and exit Photoshop. You removed the clipping mask by using the Release command on the Layer menu, restored the clipping mask by using the Undo command on the Edit menu, saved a copy of the image, and then flattened the file. Key: Menu items are indicated by > between the menu name and its command. Blue bold letters are shortcuts for selecting tools on the toolbox. 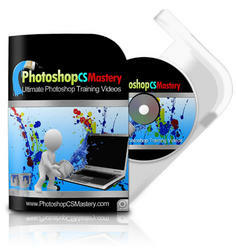 One of the most powerful editing tools that Photoshop has to offer is the ability to create and modify masks. Once a mask is placed on a layer, you can edit its shape using the Brush Tool. Mask pixels can be painted in, or painted away, so that your image looks exactly the way you want it to. A mask is automatically linked to its layer, so that when you move a masked layer, the mask moves with the layer content. You can also select multiple layers and move them as a group. Multiple layers can be aligned and distributed when they are selected as a group. Once you are satisfied with the results of a mask, you can choose to disable it, delete it, or apply it to the layer. 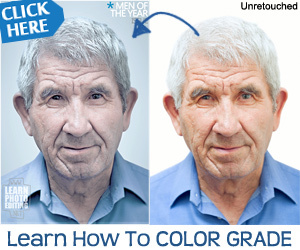 An adjustment can be used to make color adjustments to a layer without permanently affecting the pixels on the layer. An adjustment layer can affect all the layers beneath it, or just the immediate layer beneath it. This feature makes it possible for you to try your changes without permanently changing the layer's content. Like masks, you can disable an adjustment layer, delete it, or apply it by merging it with its layer. Adjustment layer A special layer that lets you make color modifications without permanently changing the actual layer. Base layer The bottom layer in a clipping mask, or group; serves as the group's mask. Blend If color Determines the color range for the pixels you want to blend. Clipping mask A group of two or more contiguous layers that are linked for the purpose of masking. 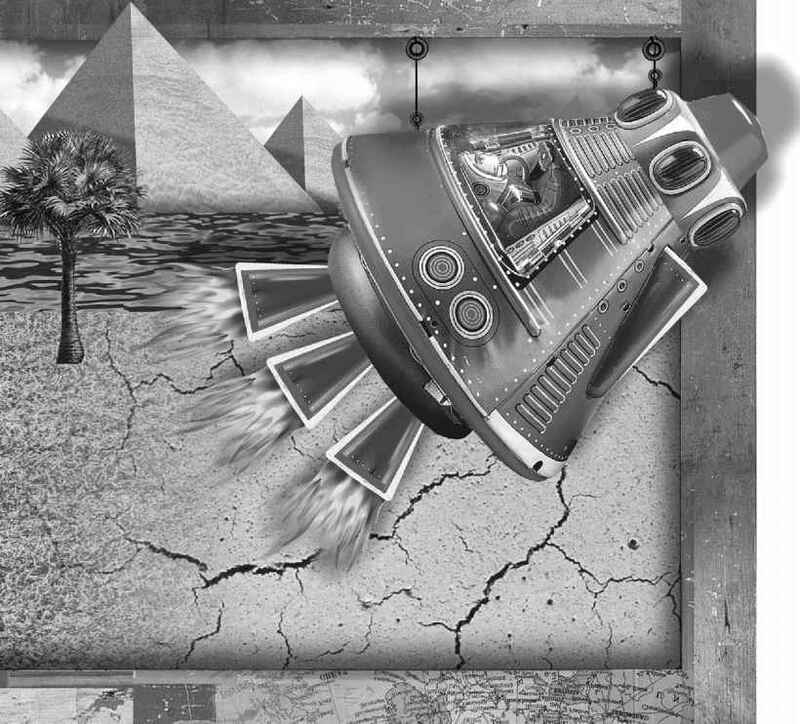 Layer mask A feature that can cover an entire layer, or specific areas within a layer, and can be used to change dimensions when transforming the object. This Layer slider Specifies the range of pixels that will be blended on the active layer. Transform Box A rectangle that surrounds an image and contains handles. Transform Changes the shape, size, perspective, or rotation of an object. Underlying Layer slider Specifies the range of pixels that will be blended on all the lower layers. How to deactivae clipping mask in adustment layers? Where is the clipping mask on photoshop? How to make a clipping group on photoshop?